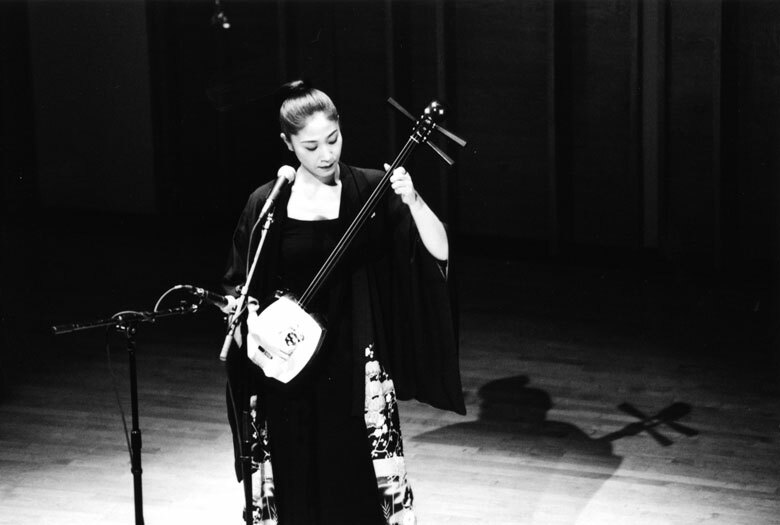 Both the February 9 Washington, DC performance, (held at Japan Information and Cultural Center, in the Japanese Embassy) and the February 13 New York City concert (held at Merkin Concert Hall) featured the renowned master of the Tsugaru shamisen, Chikuzan Takahashi II, who performed traditional pieces for shamisen and voice including “Shamisen Yosare,” “Tsugaru Aiya-bushi,” and “The Sand Dunes of Tosa”; her own compositions set to texts by the avant-garde poet-playwright Shuji Terayama and Misuzu Kaneko; and shamisen improvisation. The New York concert was followed by a symposium – “Music from Japan: Searching Its Origins” and a keynote lecture – “The Aesthetic Roots of Japanese Music” during which musicologist Tomiko Kojima traced the roots of Japanese music to its earliest existence. Interpreter Sharon Nakazato moderated the panel. On February 12, Music From Japan held an evening of events in New York at Merkin Concert Hall starting with a lecture on the music & life of Hikaru Hayashi, which featured Mr. Hayashi with Sharon Nakazato as interpreter. This was followed by a concert spotlighting the works of Hikaru Hayashi. The Tokyo String Quartet gave a world premiere of a Music From Japan commission with funds provided by the Mary Flagler Cary Charitable Trust. A monumental choral work which starkly and movingly chronicled the aftermath of the atomic bombing of Hiroshima, Little Landscapes of Hiroshima for Mixed Chorus (1967/68) with text by Tamiki Hara, was performed by The Vox Vocal Ensemble (George Steel, director). The composer gave a cameo performance in his Sonata for Flute and Piano (1958/71), yet another Music From Japan commission to see its world premiere that evening. Performers also included Martin Goldray and Hikaru Hayashi, piano; Susan Palma Nidel, flute; Eriko Sato, violin.